Ray Kelley’s career has spanned more than five decades, playing in orchestras, recording tele-vision commercials and records, and touring the world. 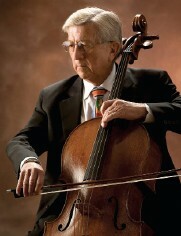 Kelley is currently principal cellist for the long-running television show, The Simpsons, and has played The Bob Hope Show, recorded with Aersosmith, Frank Sinatra, and the Beach Boys, and is also a former member of the Utah Symphony Orchestra, the Dallas Symphony Orchestra, and the Los Angeles Philharmonic. “I’m a lucky guy,” Kelley says. “I can’t even believe it. I’ve been very fortunate to have this life.” Kelley followed in the footsteps of his father, Richard F. Kelley, who was principal string bass in the Los Angeles Philharmonic. Ray and his older brother, Richard D. Kelley, also of Local 47, started on piano. At the age of 13, Ray began cello and his brother switched to the bass. His father, who was also an AFM member, knew someone looking for a cellist to play for the Spade Cooley Show, broadcast on KTLA-TV. Kelley was still in high school at the time and, while it lasted only a few months, it helped propel him into a career in music, joining the Utah Symphony Orchestra at age 18. Kelley recalls his first recording session for a Motown singer. At the time he was playing with the Los Angeles Philharmonic, which he had considered his dream job. “I became so busy recording that I quit the Philharmonic in 1968 after a world tour,” he says. He did around 35 to 40 sessions a month mostly for records at first, but eventually working for television and motion pictures. He played in the various incarnations of the Star Trek series, and has been with The Simpsons for 19 years. Cellist Ray Kelley of Local 47 (Los Angeles) has enjoyed a full recording career that includes TV shows The Simpsons and Star Trek. His company, Resort Music, produces destination music. Kelley’s also a traveler. In the past 20 years, he’s been to Europe about 25 times, and participated in seven recording sessions in Berlin. In 1988, Kelley started his own company, Resort Music (www.resortmusic.com). A project in the early ’90s to produce authentic Italian and German folk music to play on satellite radio stations broad-casting in American restaurants led him in a new direction. He records destination CDs with Local 47 members for hotels and tourist centers. The CDs include Above and Beyond Windy City, a tribute to Chicago; a musical salute to the Sound on Wisconsin; and A Strand of Desert Pearls, a musical tour of Palm Springs. Each CD comes with images of the destination, travel guides, and maps. His wife, Cheryl, also of Local 47, is in charge of company operations. Kelley is also the music advisor for the Palm Springs Unified School District, where he performs for children and speaks about the importance of music. Singapore's MAX Atria Debuts Resort Music "Soundscape"